Eight-year-old Joe Radburn spends many Mondays “doing data.” Joe is a regular participant in Makeover Monday, a weekly exercise in reimagining data visualizations. “My dad downloads the data, and then I have like 20 minutes to kind of get happy with it. Then once I’m happy with it, my dad looks at it,” says Joe. 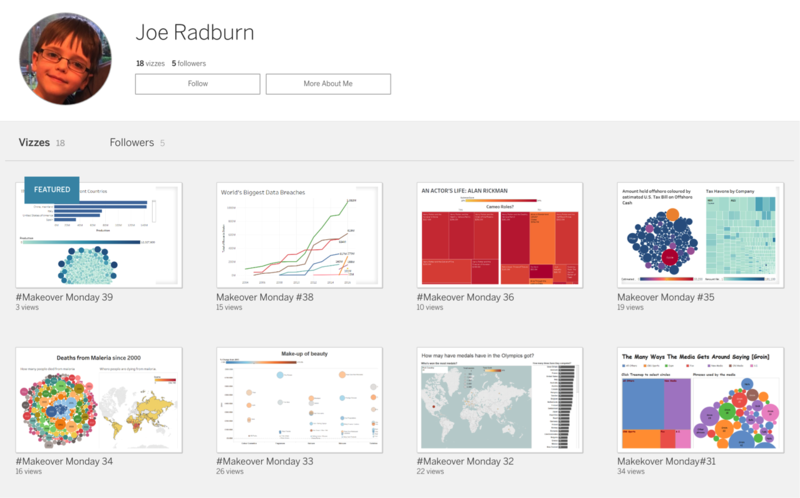 Joe spends the time exploring the data, says his dad, Tableau Zen Master Rob Radburn. Then Dad helps him with any final formatting touches for his viz, usually adjusting colors or enlarging fonts. “He iterates really well. He just drags all the dimensions and measures into view and looks at them, then drags them back,” he says. Joe finds the patterns in the data, says Rob, then asks his dad to explain their meaning. 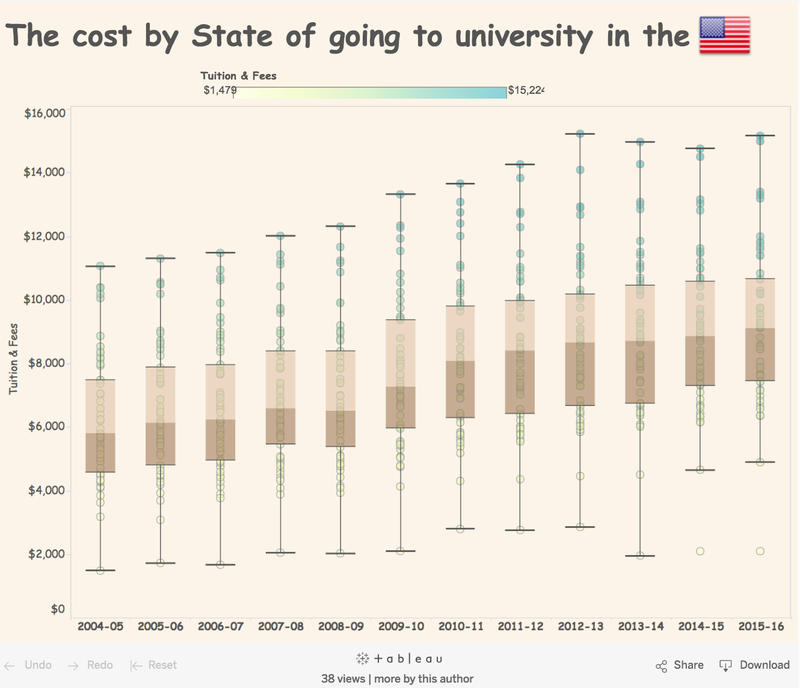 “Like with the box plot, he saw the pattern in the data and said, ‘What does that mean?’ And I said, ‘It shows you that it’s getting more expensive to go to university in America,’” says Rob. It all started when Joe saw his dad participating in Makeover Monday. “Joe likes math, computers, and, hopefully, his dad. So this combines all three things. He saw me spending time doing this and wanted to join in,” says Rob. Rob gave him a quick tour of Tableau—how to drag and drop, and how to use the Show Me box—then turned the mouse over to Joe. And Joe, who’s had a lot of practice on the computer thanks to Minecraft, picked it up pretty fast. So far, Joe has created 18 vizzes, and he’s found his own style along the way. Joe is especially fond of Comic Sans. 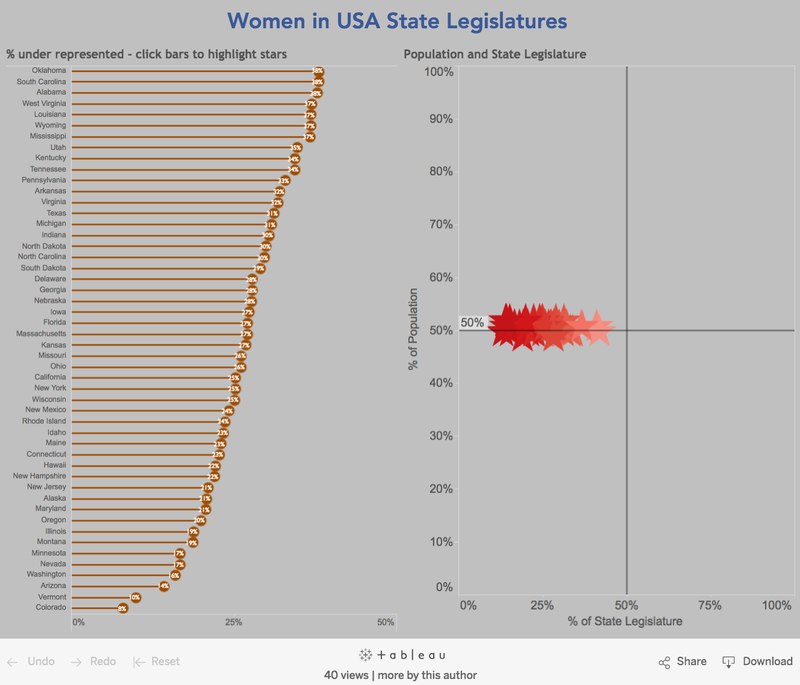 He also likes to add his own touches, like the stars in his Women in the USA State Legislatures viz. “I quite like that one because when you click on a star, it highlights the matching lollipop,” says Joe. And design tricks aren’t all Joe picked up. He’s even taught his dad, a Zen Master, a tip or two about Tableau. Rob says he never taught Joe how to iterate; Joe picked up on his own. Rob suspects Joe does so well because he just focuses on the data and doesn’t worry about much else. He keeps it simple. “He doesn’t overthink it. I’m burdened by what I’ve done in the past and by being a Zen Master, thinking, ‘oh, I’d better do something acceptable.’ He doesn’t have any of that. He just gets lost in the data,” says Rob. He also relishes being part of the Tableau community. Every time Joe creates a viz, he tweets it to Andy Kriebel, co-founder of the project, and Andy replies with encouragement. Joe so looks forward to these exchanges, says Rob. Joe is aiming to participate in at least half of this year’s Makeover Mondays. “I quite like it. And I’m getting better at the design and learning how to do different things to make it better,” he says. “It’s just a half an hour; we don’t spend hours on it. And it’s nice to do it together," says Rob. 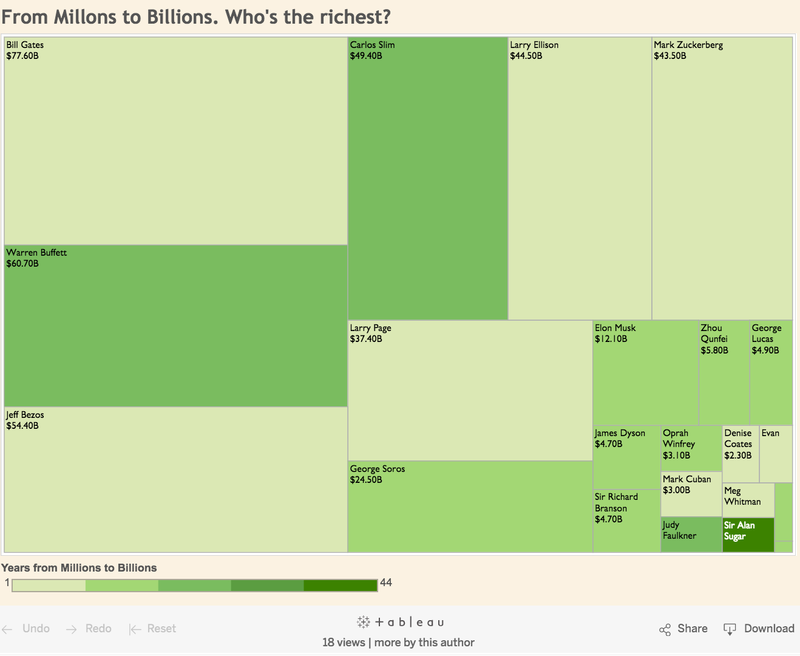 For more vizzes by Joe, check out his Tableau Public profile page. Data kids and parents, we invite you to join our data-kids community group! Please sign up here to request access. I just completed a project with my daughter to plot the tides and the phases of the moon. While doing this by hand does have its place toward data appreciation and meaning, I'm inspired by Joe to explore how Tableau can be brought into K-12 settings. Think of how topics like geo-politics, science, and math could be brought to life. Anyone ever do this and have ideas to share? Thanks Joe! Thanks for the inspiration. I can see myself doing this with my kids some day. I got a call from my lover today asking for my forgiveness and I just wanted to let you know Dr Obodo that I am extremely impressed. Keep up the good work. I will definitely be ordering more . everyone E-mail Dr Obodo at templeofanswer@hotmail.co.uk if you needs his help Thanks!